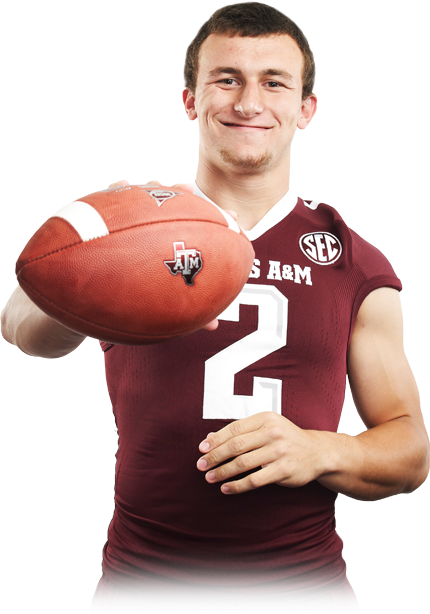 Returning Heisman Trophy winner Johnny Manziel. Early last December we had the first redshirt freshman win the Heisman Trophy. Everyone marveled at “Johnny Football’s” mobility in and out of the pocket. His touch once he threw the football during games, and a slew of YouTube tricks to marvel at. Yet no one thought of the light that would be shown on a 20 year old kid. The scrutiny that would follow him off the football field has led to an off-season of setbacks. All of which culminated with his removal from the Manning passing camp. In the ever-changing world of social media, there is light where there has never been before. Any anonymous person, can take a picture of you while in the middle of devouring a cheeseburger, and link it to the rest of the world via Facebook, Instagram, Twitter, etc… Caught in this lurch are the first generation of athletes who can’t escape the limelight of the media, now that the American populace has become a part of it. Athletes are having to mature faster and think quicker on their feet in regards to what their actions can possibly cause. Twitter, Facebook, and Instagram had just cooled from the Pouncey twins sporting “Free Hernandez” ball caps. This of course in reference to former Florida Gator teammate Aaron Hernandez, who has been accused of murder. Now comes the story of Manziel being released from the camp run by the Mannings. He’s been blown up on social media for a series of transgressions this off-season. Pictures of him in drinking establishments although he’s not 21. The rest of us football fans have taken to social media, to express ourselves about Johnny Manziel and his celebrity. First and foremost, let’s not forget this is a 20 year old who was at a football camp. The camp is there to mentor and train hundreds of prep school and college signal callers about the nuances of playing the position. Of course they were covering 3, 5, 7 step drops, Pistol shotgun mechanics, and footwork. Here is the reigning Heisman Trophy winner attending a football camp to help the next generation. Although he has a lot of light on him for various reasons, he was kicked out of the camp and now has to deal with the embarrassment on ESPN and social media all alone. The Chancellor of Football’s take?? I would think higher of the Mannings had they sat Johnny Manziel down and mentored him about professionalism and kept things in-house. Between Archie, Peyton, and Eli, there is nearly 40 years of NFL experience between them. Just like Johnny, Peyton and Eli grew up affluent also so they could identify with his position. This isn’t a poor college student who can only afford to go home and train out of the spotlight only. To boot him out and say”Oh we’d invite him back” while he now has to be a 20 year old in damage control mode. Understand he doesn’t have an agent to coach him and he could always say the wrong thing in front of one of these cameras. Yet lets ask ourselves a question: What were all of us doing at 20 years of age?? Are you kidding?? I went to parties at schools in four different states let alone be a real high profile college KID. Don’t let social media warp your level of perspective. Does he need to calm down some?? Yes…why not have some compassion for his situation and sit Johnny down?? The Mannings missed a golden opportunity to mentor him in something more important than football…life. To get him to slow down and understand how living in the fast lane has derailed many careers, or worse. To know how his life is being scrutinized by future employers. To understand the 15 minutes of fame young girls, and other fans who want to befriend him will do with this instant media, can paint him in a negative light. Naturally someone may say it’s not their responsibility to tell him that. The reason they had him there in the first place was they had the platform to teach young quarterbacks about playing football. Why not take it a step further with him instead of let him twist in the wind from a P.R. standpoint?? He has no one around him to tell him NO. He’s hanging around other 20 year old kids who are more popular because they hang out with “Johnny Football.’ Don’t forget there are limited hours his college coaches can talk to him in the off-season due to NCAA regulations. Not one of them could have sat him down for a 15 minute heart to heart conversation?? We do have to keep in perspective that he’s only 20 yet let’s empathize with what he’s dealing with also. If I tapped you on the shoulder and told you I have pics and vids of your behavior to upload to facebook from you at 20, how wide would your eyes get?? Exactly. For what we’ve heard this off-season give this kid a break, he’ll learn from this. The number one thing for him is he’s just a few weeks away from where he needs to be… back in school and in the safe haven of practice at Texas A & M. I hope he’s learned a couple lessons. This entry was posted in College Football and tagged college football players, Heisman Trophy, Johnny Manziel, Texas A&M. Bookmark the permalink. I guess the Manning camp only wants low profile prospects to attend since they apparently only want to teach the technical aspects of the position as opposed to the mental.